All Jeremy wants is a pair of those shoes, the ones everyone at school seems to be wearing. Though Jeremy's grandma says they don t have room for "want," just "need," when his old shoes fall apart at school, he is more determined than ever to have those shoes, even a thrift-shop pair that are much too small. But sore feet aren t much fun, and Jeremy soon sees that the things he has warm boots, a loving grandma, and the chance to help a friend are worth more than the things he wants. 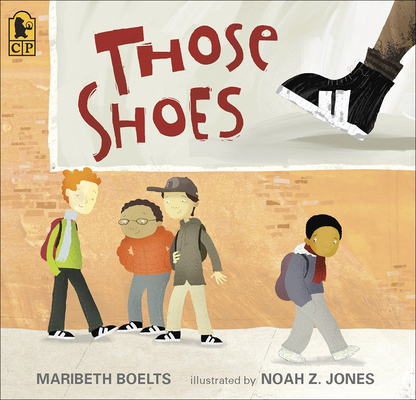 Maribeth Boelts is a former preschool teacher who has written numerous books for children. She lives in Iowa with her husband and three children. Noah Z. Jones is the illustrator of NOT NORMAN: A GOLDFISH STORY, THE MONSTER IN THE BACKPACK, and WELCOME TO THE BED AND BISCUIT. He lives in Maine.